The new musical Bandstand earned five nominations, including nods for Outstanding Ensemble in a Broadway Show and Outstanding Choreography in a Broadway Show for Andy Blankenbuehler, who won in a three-way tie last year for his work on Hamilton. Ryan Kasprzak earned a nomination for Outstanding Male Dancer in a Broadway Show. Read more about it on Playbill. After working on developmental productions of the show since 2014, I couldn't me more thrilled to make my Broadway debut in Bandstand. Under the direction of two-time Tony Award® winner Andy Blankenbuehler (Hamilton, In the Heights) this swing fueled original piece will play the Bernard B. Jacobs Theatre. 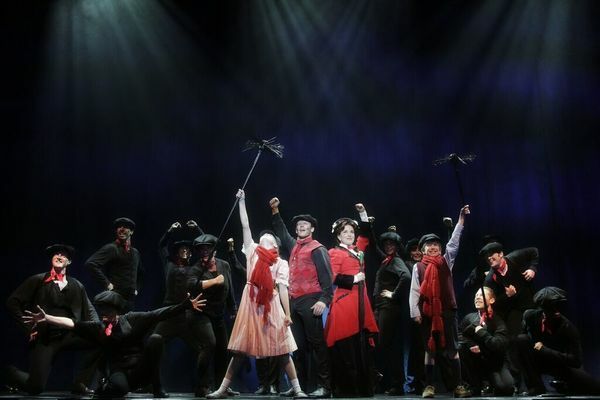 I jumped at the chance to collaborate with director Eric Woodall and choreograph Mary Poppins at North Carolina Theatre. Lucky to once again team with my frequent collaborator Tom Caruso for the world premiere of Brave New World: The Musical at NC Stage Company. Based on the classic novel by Aldous Huxley where two worlds collide in a provocative story about love, humanity, and loss, set against the backdrop of a place where the most dangerous offense is an original thought. I could not be more proud or excited to choreograph this beautiful show at the Public Theater. Based on Kate Davis’ 2001 Sundance Award-winning documentary, SOUTHERN COMFORT tells the true story of a group of transgender friends living life on their own terms in the back hills of rural Georgia. Winner of the prestigious Jonathan Larson Award, this folk and bluegrass inspired musical is a celebration of redefining family and choosing love over every obstacle. Read the very kind words of Mr. Isherwood of the NY Times. After several developmental workshops, I am incredibly excited to be part of the cast for the world premiere of The Bandstand at Paper Mill Playhouse. Set in 1945, The Bandstand tells the story of a mismatched band of military veterans who join together to compete in a national radio contest in New York City with a prize that will guarantee instant stardom to the winners. The Bandstand begins performances Thursday, October 8, 2015, and runs through Sunday, November 8, 2015. Get tickets HERE or scope out the press release. I'm spending a few exciting weeks in Sonoma performing and creating with Transcendence Theatre Company. Come scope out Rhythm of Life in Jack London State Park from August 7th - 23rd. Dancers of New York is a project by James Jin Images to showcase the community of dancers in New York City by featuring dancers at every subway station in the city. I was thrilled to join the project and shoot some very cool shots in my Astoria neighborhood (the shot above was taken on my block). See all the shots and read my interview HERE.